We Have Your Collectibles is the home of Fair Oaks Antiques. Now evolved from "just" a place to buy antiques and vintage collectibles, this site is a way to document as well as showcase some of the items that pass through our hands. Between the hunting, buying, sorting, cleaning, pricing, selling, and shipping antiques and vintage collectibles there's a lot of obsessing, research, and writing. Now, with this new site, we can share more of that. With all the work we do in antiques and collectibles, we are often asked about appraisals. Here’s what we know, and what we do. First of all, it is important to note that there is no such thing as a licensed appraiser in the United States of America. Unlike real estate appraisers, antiques appraisers (also called personal property appraisers) are not regulated at either the state or Federal level. Therefore, there are no state or “U.S. certified” antiques appraisers. There are, however, various appraiser societies such as the Appraisers Association of America (AAA), American Society of Appraisers (ASA), and International Society of Appraisers (ISA) which provide certification to their accredited members. These members have paid for such training and certification and they (rightfully) expect to profit from it. However, as such an investment in certification may not be a financially viable option for professionals in smaller towns, rural areas, and other less populated areas, you may not have access to such an appraiser locally. If you’re looking to sell an item yourself, or are just curious about the value of something, we recommend reading this article (by moi) and/or paying for a service like PriceMiner. If you don’t have the time, or are too overwhelmed for such condition comparisons and investigations, we offer research services which will help you get a “snapshot” perspective of the market as it is now, and, should you have a very valuable item or collection, we can refer you to the contacts we have at Cowan’s Auctions, Heritage Auctions, and/or Ivey-Selkirk. If you are rather certain that what you have has great monetary value, these auction houses will perform “verbal” or non-official appraisals to provide estimated auction values — even if you do not consign your item with them. It is important to note that these services are not the same as appraisals for insurance, contractual, or other official purposes. (Heck, sometimes even your local pawn shop may require an official written appraisal in order to give you a more realistic value on a piece of fine jewelry.) In these cases, you will want someone who can properly complete the necessary paperwork to satisfy the requirements of your insurance company, the Internal Revenue Service (IRS), etc. In those cases, you’ll need to pay for the professional services of an appraiser. (Yes, jewelry stores charge for these sorts of appraisals too.) If you are unsure of where to start your search for a reputable appraiser, you should know that the aforementioned auctioneers and other auction houses such as Sotheby’s will provide acceptable official written appraisals for insurance, estate, tax, or other legal purposes — for a fee. These companies may reduce the appraisal fee if you opt to use their auction services. In the end, the type of appraisal help you need for your antique or collectible item is actually dependent upon one thing: your need of the appraisal. Are you curious? Hoping to make a few bucks? Or do you have a legal or contractual obligation for the appraisal? Lastly, remember that the antiques and collectibles market, like any other, changes. That means appraisals, no matter who does them, ought to be performed every two to three years. 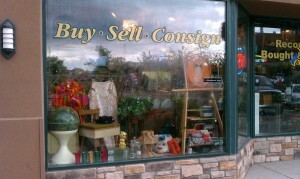 PS The photo (which you can click on to see a larger version) is of our recent display (of mostly Mid-Century Modern items) in the window space we have at Antiques On Broadway, in Fargo. 7 Responses to "About Antique & Collectible Appraisals"
I have an 154 piece bronzeware set I purchased in Bangkok Thailand In 1968 I was just wondering what the value might be,what would be my first step? On The Radio Tonight, Fargo-Moorhead! New Vintage Clothing Shop In Fargo-Moorhead! Derek's work for Prairie Public Radio‘s Dakota Datebook.